March ticked by slowly in a blur of illness. In between cleaning throw up, blowing noses, busting a vessel in my eye, and losing my voice, I had my best direct sales month ever. We made two trips as well, one for my sister’s birthday and one for Leadership Training for Christ. I learned a lot about having two children and illness, and fighting illness while still trying to be a good mom. For this week’s seven quick takes, your recovered Blogger will share seven lessons. Illness will not hit all the people at the same time. It attacks one person at a time, sometimes leaving completely from one before hitting the next. This means one child will be unable to move or wake up while the other dances and chatters around him/her. This also means that when it hits the Mama, everyone is prattling around her while she is unable to function. Illness doesn’t affect all the people in the same way. We had some sort of crazy, mutating Super Bug. When it started with Dietrich, he went from his bed to the couch to the loveseat to our bed, barely waking up in between for almost 48 hours. Madilynn, however, would only be reasonably still and rest if I was holding her. Viruses don’t leave, they mutate. We went from this to Dietrich having a terrible cough and runny nose and Madilynn having an ear infection and pink eye. She generously shared the pink eye with both parents. After that, we had the throwing up version – which very sadly started on the way back from our first trip. Dietrich’s had problems in the past, so I attributed it to a possible food issue or car sickness… until Madilynn threw up two days later. In her bed. Then in my bed. She’s still a bit traumatized and talks about the throw up every night. I couldn’t convince her to throw up in the bucket instead of all over the house… Our Bissell steam cleaner received quite the workout. Even with everyone so miserable, we still had to go grocery shopping. Mostly because we ran out of juice. We still had to do all the mundane things… by we, I mostly mean me. Laundry, cooking, dishes, cleaning…. It never ends. During illness, it just gets messier! The Super Bug steals that which is most inconvenient. When the pink eye and (what likely became bronchitis) coughing hit me, it also took the one thing a mom needs most: my voice. I went to urgent care as soon as I arrived at my parents’ because I simply couldn’t keep going. I received a steroid shot. 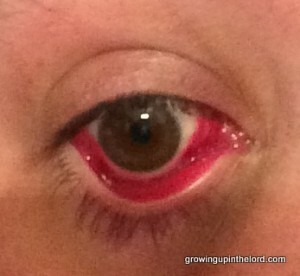 A couple of days later, I realized my eye problem was actually a burst vessel. Really pretty, by the way. By the end of the week, I could talk again and didn’t feel like my throat had a softball lodged in it. Once again believing we were done with the bug, we continued preparing for LTC, in spite of the sudden change in plans. The bugs stayed away while we were gone. We had no incidents on the drive home. Then Dietrich developed a high fever with chills and a headache – symptoms similar to that of our friends’ recent illness. I mentally prepared to continue the War on the Super Bug, all while doing everything I could to keep him comfortable and strengthen his immune system. Sometimes all of the best efforts to fight germs, maintain a healthy home, and build immunity through proper nutrition and supplements isn’t enough. While this is hard, because we want to be Super Mom and fix or prevent all the bad things, maybe it’s the overwork that makes the illness kick us down so hard when it catches us. A great lesson in humility. A great reminder to slow down and not “do it all.” I certainly did more praying during this time and somehow, I know God is blessing us through it all. Getting sick is the worst! It just goes round and round the family, and the more you have the longer it takes (I actually encourage us to just all spread the germs freely so we can get it over with already instead of drawing it out!) And I have also lost my voice once or twice as a mom – the house has been trashed by the time I get it back because I have to save my words for matters of life and death! Unfortunately, my voice was gone and we were driving the many hours to my parents’ house. I kept getting worse, hence the urgent care trip. By the time we left a few days later, I had a bit of voice back and felt so much better. I THINK we are well for the time being!